SAN JUAN, PR — The non-profit organization Ciencia Puerto Rico (CienciaPR, www.cienciapr.org) received $25,000 from the JetBlue Foundation for its "Ciencia al Servicio" (Science in Service) project, which seeks to transform the way science is taught in Puerto Rico. 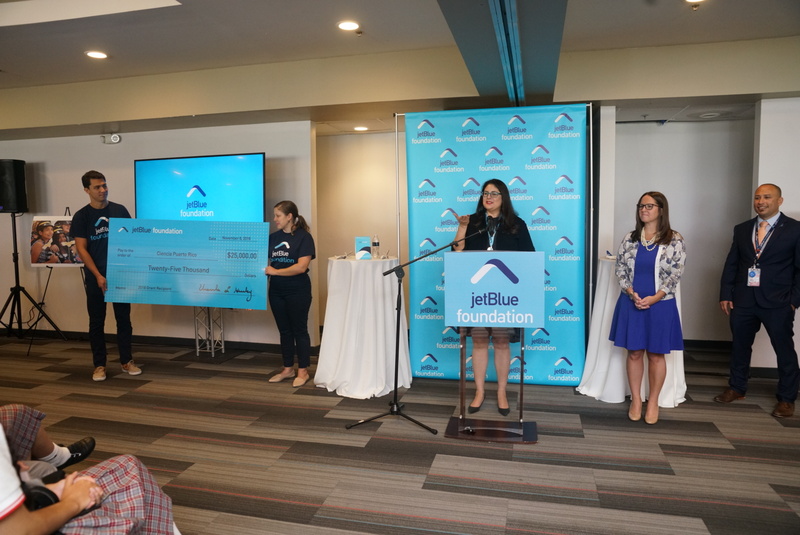 The JetBlue Foundation awarded $135,000 in total aid to Ciencia Puerto Rico, EcoExploratorio, Inter American University of Puerto Rico and PRAMI (Puerto Rico Aviation Maintenance Institute). The grants are part of 100x35JetBlue, which is JetBlue’s ongoing initiative to help Puerto Rico recover from Hurricane Maria through 35 ways over 100 days and beyond, with JetBlue now focusing on the long-term phase. JetBlue currently serves three destinations in Puerto Rico including its San Juan focus city where JetBlue is the largest carrier, as well as Aguadilla and Ponce. This year, JetBlue celebrated its 16thh anniversary of service to Puerto Rico. The new president of the JetBlue Foundation, Ursula Hurley, was present to distribute the funds in a special ceremony on November 8—National STEM Day. The organizations that received the awards focus on increasing access of students and communities traditionally underrepresented in the fields of science, technology, engineering and mathematics (STEM). "JetBlue's support for “Ciencia al Servicio” will help us provide students in Puerto Rico, particularly those in the southern region of the island, with science lessons that are more exciting and effective, based on exploration and inquiry, and that are linked to their lives and communities," said Dr. Giovanna Guerrero-Medina, Executive Director of CienciaPR. "Jet Blue's contribution will facilitate collaborations between educators and STEM professionals to create science lessons, and allow those professionals to interact with students in schools, so that young people can see themselves in STEM careers, and learn how they can use their STEM skills to contribute to their communities," added Dr. Greetchen Díaz-Muñoz, Director of Science Education Programs and Community Partnerships for the organization. Beyond just grants, the JetBlue Foundation provides in-kind support, mentoring, internships and much more to make a difference for the next generation of aviators, engineers, dispatchers, schedulers, aircraft mechanics and pilots and other STEM professionals. Over the past five years, the Foundation has built ongoing relationships with more than 50 aviation and STEM-focused programs and provided over $1.1 million in grants to help these programs take off and soar. For more information on the JetBlue Foundation, visit jetbluefoundation.org.